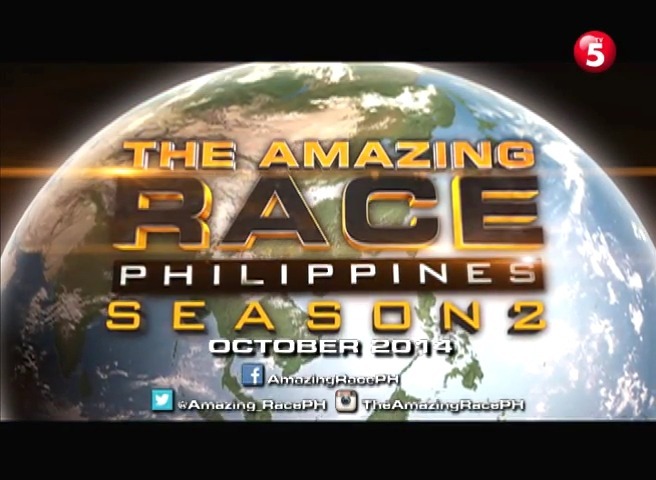 UPDATED: The Amazing Race Philippines Season 2 Premieres in October + New Title Card Revealed! The Amazing Race Philippines has teased a big pagbabagong anyo all week long and here it is! The Amazing Race Philippines has unveiled its new title card, inspired by the current TARUS look which debuted with season 23. TARPh will be the first international version of the franchise to adopt the current TAR graphics, though the early title card for the brand new and currently in sporadic production Chinese Amazing Race also uses their own version of the fresh look. also reveals an OCTOBER premiere date! As for when the season is set to start filming, it would be no earlier than August 17th as host Derek Ramsay will be appearing with fellow TV5 stars at a Filipino expo in Canada on August 16th. It will definitely have to be soon if the season is set to air in October. Meanwhile, some celebrity sightings in the teaser. There’s former Pinoy Big Brother housemate Paul Jake Castillo and his partner Jules. Paul Jake and girlfriend Kaye Abad actually expressed interest or actually auditioned for season 1. Also familiar are former Wowowee co-host RR Enriquez and former Pinoy Big Brother villainess Wendy Valdez as well as actress and Survivor Philippines Celebrity Showdown castaway Karen delos Reyes and partner. Another celebrity auditionee is singer Ney Dimaculangan (former lead singer of 6cyclemind) who appeared in earlier teasers. Celeb teams are fine, but hopefully there are more regular, everyday Filipinos too. So lots of very exciting stuff on the way for season 2 of The Amazing Race Philippines! Be sure to follow TARPh on Twitter, Facebook and Instagram!